There will be no other major terror attacks, weather catastrophes or government mismanagement. Certainly there will be more banking and other business failures. There is always weather. Terrorists will continue to attack. The government will make errors in the view of nearly everyone. But as long as these incidents are within the normal range of the nightly news and do not provoke a heightened state of panic, it is reasonable to conclude that the damage causes are behind us. Let's say for example, that I am too pessimistic. That would infer that the job losses will cease earlier than I predict. This being March, and the numbers still showing large losses, I don't think I am wrong on that side. If however I am too optimistic and the job losses continue to increase past May, the situation is correspondingly worse than I have described. Since my prediction is already more dour than others I see published, I am quite happy to stay where I am. I would now like to skip the traditional recap of all events leading us to this point. We have all heard enough of the restatements of the facts. Instead, let's focus on determining the future. 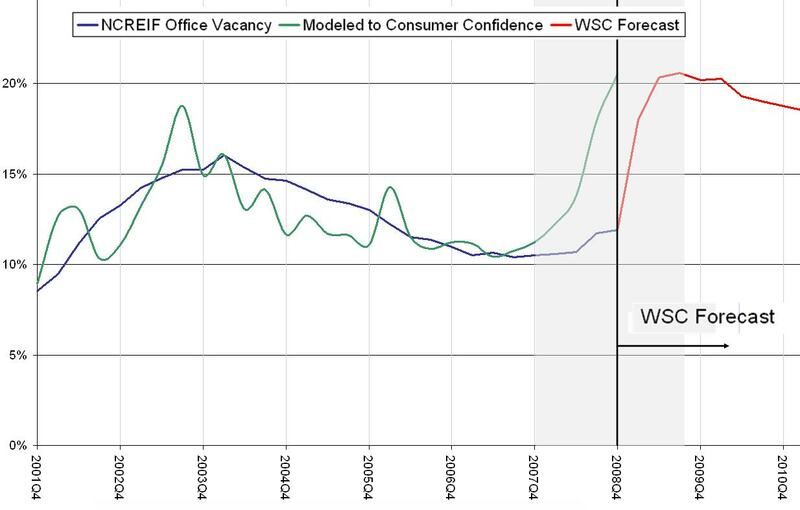 This forecast predicts a 10 percentage point increase in vacancy, based upon an historical analysis of the relation between Consumer Confidence and U.S. Office Vacancy. Over the 25 year history of the NCREIF data, there is a very tight correlation with The Conference Board's Consumer Confidence. A simple regression using four quarter smoothing and a two quarter lag produces an R2 of 92% and a 32% value when comparing the percentage changes. Simply put, there is a strong relationship between the two variables.